It wasn’t too long ago that I stumbled upon an anti-abortion protest outside of a Planned Parenthood clinic that was across the street from my shopping destination. Even though I adamantly disagree with the protesters and doubt that they understand all of the non-abortion services that Planned Parenthood provides, I think their hearts were in the right place. They want to protect fetuses that they consider to be babies. To further their efforts, pro-life groups have fought to pass anti-abortion laws (which are frequently overturned in court as unconstitutional, most famously in Planned Parenthood v. Casey) and opened crisis pregnancy centers that show ultrasound images to pregnant women (a tactic proven to be ineffective at reducing induced abortions). I’d like to suggest that if their real goal is to save the lives of babies in the USA — both born and unborn — they might want to focus their energies elsewhere. First, the good news from the USA. In 2011, induced abortion rates in the United States fell to their lowest since the landmark Roe v. Wade decision. Another good sign is a declining infant mortality rate…reported at 6.05 deaths before the first birthday per 1,000 live births in 2011, which was a 12 percent drop from 2005. So we’re getting a little better at this. The bad news is that better is still not very good by international standards. 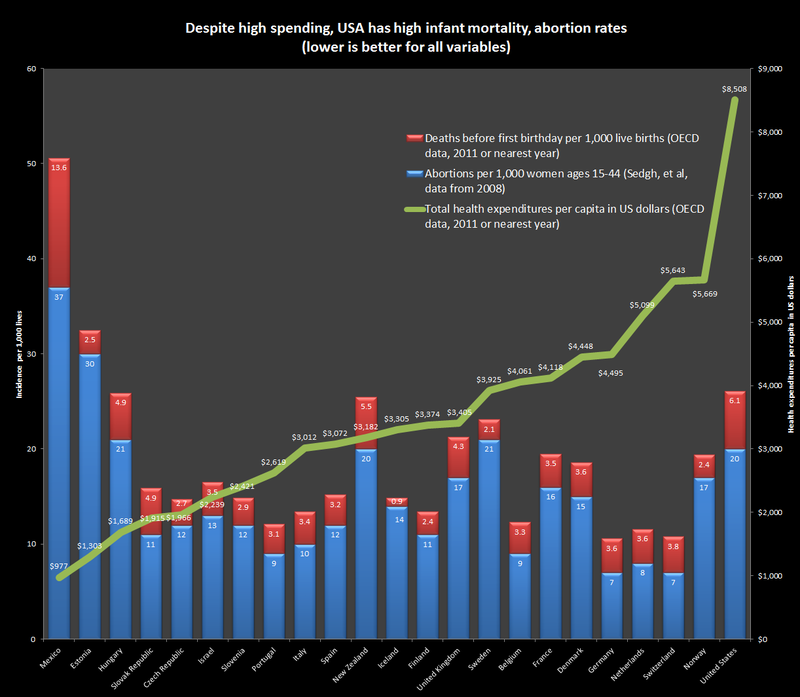 Despite spending more than any other nation on earth for health care per capita, the United States (depicted on the far righthand side of the chart) still lags behind many other countries in terms of infant mortality and abortion rates. Although the United States is not the worst performer on the list in terms of abortion and infant mortality, countries like Mexico and Estonia spend far less on health care per person. Please note that lower numbers for all variables always indicate better performance in this chart. But is more health spending the answer? A quick glance at the data would suggest not, since the United States has the highest health care spending on earth, both in real dollars and as a percentage of gross domestic product. In terms of the unborn, even though the U.S. abortion rate is dropping, it’s still too high. In 2008, the United States reported a rate of 20 induced abortions per 1,000 women ages 15-44. Germany, the top performing country, reported only 7. What’s interesting is the inverse correlation between restrictive abortion laws and the number of abortions…especially the number of unsafe abortions. That is, the more restrictive a country’s abortion laws are, the more abortions occur. And they are of the unsafe, back-alley variety that endangers women’s lives. It’s worth pointing out that the study classifies the U.S. as having liberal abortion laws, but obviously the people picketing outside of Planned Parenthood are hoping to change that. So what’s a country to do? Just because the United States spends more on health care by far than any other nation in the world doesn’t mean we’ve been spending the money very wisely. Indeed 31 percent of U.S. healthcare spending is on administrative costs. But Sedgh, G. and colleagues offer an idea. Fortunately, the Patient Protection and Affordable Care Act (that is, Obamacare) goes a long way in improving access to contraception and other women’s preventive health programs that can also reduce infant mortality rates. Unfortunately for a lot of born and unborn babies, the pro-life crowd has spread a lot of misinformation about the impact of the Affordable Care Act’s women’s preventive health provisions. To be clear, Obamacare does not provide any funding for abortions, nor does any other federal program due to the Hyde Amendment. Even the Medicaid funds that Planned Parenthood receives are specifically for the non-abortion services it provides…just like any other health provider that provides these services. The Supreme Court recently heard arguments in the Sebelius v. Hobby Lobby Inc. case in which Hobby Lobby argued that the law’s required coverage of emergency contraception (Plan B and Ella) violated their religious beliefs, and they should not be required to include it in their employees’ insurance plans. Pro-life groups have inaccurately referred to Plan B and Ella as abortifacients, probably for political reasons. In reality, even traditional birth control pills can prevent implantation in the uterus (not just conception), so the distinction is totally made up. An overly simplistic view of policy. If you tell someone that something they abhor is legal, the intuitive response would be to say, “We should try to change that law” because they don’t want it to happen anymore. Of course, sometimes reality is counterintuitive. When abortion is not legal, desperate women still get abortions…it’s just that they are of the unsafe, back-alley variety. Conservatives who oppose gun control measures should understand this line of reasoning: if you make performing an abortion a crime, then only criminals will perform abortions. Unspoken motivations. Access to contraception and abortion has been a major step forward for the rights of women, and conservatives tend to be uncomfortable with that. Sure, the early feminists like Elizabeth Cady Stanton and Susan B. Anthony opposed abortion, but the abortions they opposed were unsafe and coerced by men. They had no concept of abortion in the way we think of it today as a safe medical procedure initiated by the woman. Political wedge issues. Politics is a very ugly business sometimes, and if you can portray your opponents are murderers, that’s pretty effective. That’s precisely what the GOP has done with the abortion issue, and religious conservatives have overwhelmingly rewarded them for it, often voting against their economic interests to vote for pro-life candidates. Don’t fall for it. The data shows overwhelmingly the pro-life crowd is (perhaps unintentionally) harming the babies they claim to cherish. With only a few days left to go before the March 31 deadline, there was real cause for concern that enrollment on the health insurance exchanges would not come anywhere close to the goal of 7 million enrollees. After all, between October 1 and March 21, fewer than 6 million Americans had enrolled. Some had revised the goals down to 6 million…a major blow. But more than 1 million Americans jumped on, as they often do, at the last minute, enabling the exchanges to exceed the original goal of 7 million. It just goes to show that it’s human nature to procrastinate.